ARM's chief executive Warren East has told TechRadar that the key to successful mobile devices will be building them to be capable of taking advantage of the latest hardware technology without sacrificing the thousands of applications already built. Speaking at the launch of the Arm Cortex-A7 processor, East was pushing the company's new big.LITTLE design which allows high-end devices to switch between two processors, one for always-on and less intensive tasks – such as checking email or listening to music – and one powerful enough to run complex new applications and games. East believes that the key to this concept is that applications written for older platforms will not need to be retooled to take advantage of the new hybrid offering. "The innovation here is the seamless switch," East told TechRadar. "You can build a system on a chip device today with existing ARM microprocessors and have a big high-performance one and a small low-power one and swap the tasks from one to the other. "The point is that the programmer would have to consciously say 'I'm going to run this app on the higher powered processor'. And that means if you were to take software from one platform and run it on another one you would have to do…something to make that happen. "[On the big.LITTLE platform] applications that are written to run on, say, an ARM 8 processor can run on this hybrid and it doesn't matter." 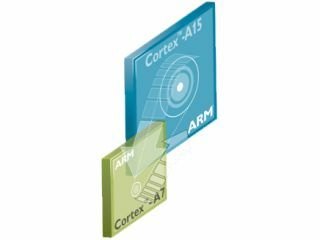 East says that ARM's entire philosophy is on ensuring that applications and programs written for older products neither cease to function or hold back the next generation of devices. "You're not going to have a very successful product if you have to have special software to run the thing," he said. "At the moment everybody is writing thousands of apps to run on mobile platforms and we want people to be able to build new products with new system on the chip devices in a couple of years time and take advantage of the software that is already written."